Clearly, I've put emphasis on the word time. You'll understand more about why tomorrow. We have to make time in our schedules to carry out the tasks that will help us grow in our creative businesses. So if you've been following along from the beginning, the next step in our progression is to take those action items you came up with yesterday and pull out your planner. Whether it's the calendar in your phone, a big spiral or ring bound planner with lots of fun decorations, or anything in between, you really need something to write out your plan of action. Now it's time to make things happen. Let's continue with the example I've used the last few days, with the goal of creating a website full of wholehearted resources to encourage women in their creativity, faith and pursuing dreams. I made a list of goals for different time frames, then focused on the most immediate time frame (this month). 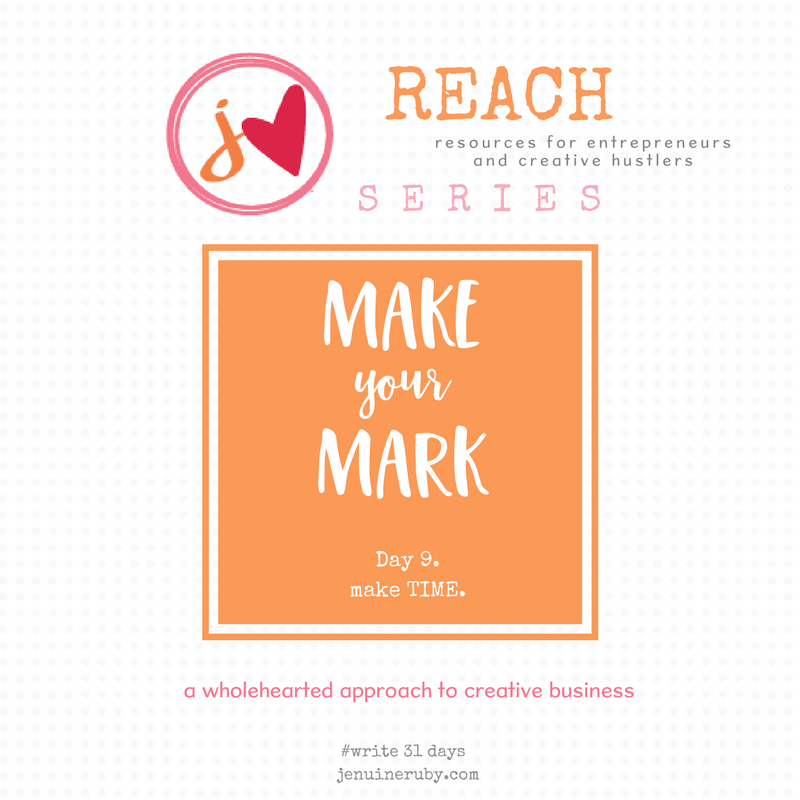 Next, I decided on a plan of action (Write 31 days), and made a plan with lists of tasks I'll need to complete to accomplish each of those goals (list of 31 things to write about wholehearted creative business). It's a good plan so far, but I can't stop there. The next thing I had to do was to decide on a time to put my plan into action. For me, early mornings are best for productivity. I live with seven other people, so I like the quiet of the early hours. If you are home during the day, maybe the best time is after the kids go to school, or during your little one's nap time. For others, it could be late at night. There's no right time as long as you make time some time! For this writing challenge, I know that I'm going to do it every morning. For other action items though, I may need to schedule it in a planner or in my phone so that I have a set aside time to focus on that activity. So I get out my planner and I commit to a time to work on it. I even set an alarm in my phone for some things so I have a reminder. I'm not trying to be basic, and I know you're capable of getting things done. I'm sharing what works for me because for years, I had great lists of goals and big dreams, but I never really broke them down into a plan of action or scheduled time to work on them, so I stayed in the wishing phase. We were not meant to be wishers! God has a plan for each of us, and when we're pursuing our purpose, we not only please Him, but we bless others and we feel alive and full of joy! That's the kind of life I want to be living. So let's get out our planners. Make them pretty if you want to. Take your list of action items and set aside time to work on them. Keep your vision board in sight. That's what you're working toward. You can do this! This is your year! Breakthrough is coming!